A bad fishing day, in most of our eyes, would normally consist of hanging your best flies in tree branches, catching nothing, getting lost, falling in or all of these things happening. But it seems that a bad day could, at least in theory, turn out to be far, far worse. 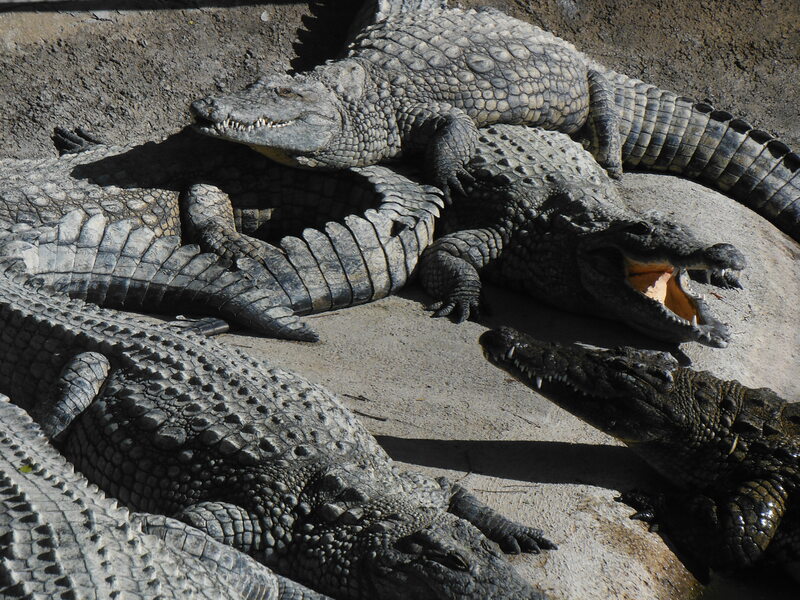 Here in Andalucia, we get the odd report of escaped crocodiles and the thought of being eaten alive is enough to satisfymost people´s definition of what constitutes a bad day. 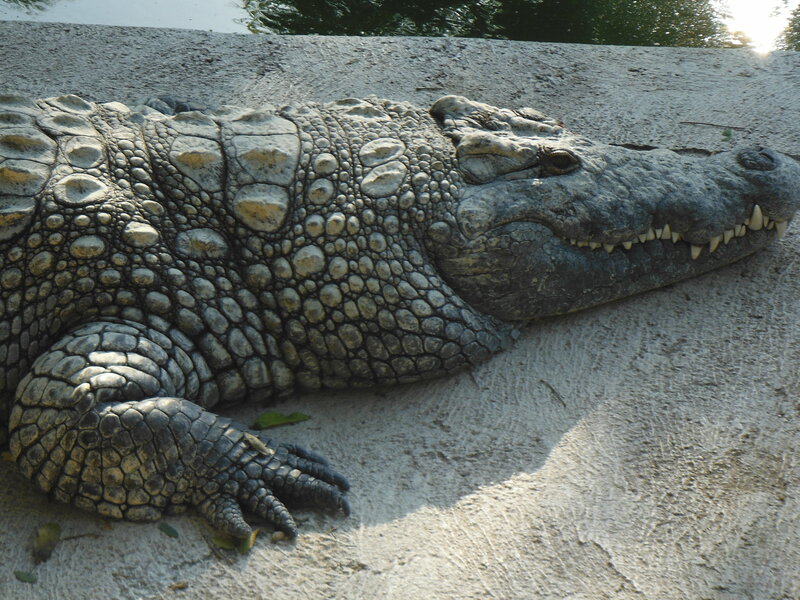 Last year a nile crocodile was seen sunning itself on the side of a little lake near Mijas. It was a place I had investigated a few years as a prospective fishing site, but its depth and difficult access made it an unsuitable venue for fly fishing. The crocodile, in the end, was found dead and an autopsy revealed the cause of death was an obstruction in its alimentary canal due to something it had eaten. This crocodile was over two metres long. A few years back at least one crocodile was caught by the civil guards on a stretch of the Guadlahorce near to Cártama. It was quite close to the Crocodile Park which has since moved to Torremolinos. Naturally, everyone thought the crocodiles had escaped from the Park but the Crocodile Park people I spoke to tell me that it is likely to have been released into the wild by unscrupulous bastards who keep these things as pets. It´s one thing getting bored with your gold fish and flushing it down the loo but cute little pet crocodiles that somebody sets free have the potential to become big horrible mean crocodiles that might take a fancy to a guy like me. This is almost certainly the way the Mijas croc turned up. Apparently, there are plenty of crocodiles kept by individuals here on the coast and the climate is ideal for these things. A few years ago new legislation tightened up on the keeping of crocodiles by individuals and, no doubt, a few animals may have been released on the quiet. The suspicions of the Crocodile Park bloke I spoke to was that the Mijas crocodile was released by a nearby Russian who was big into the drugs trade and exotic pets. Now don´t get me wrong. I think that crocodiles are great. Nobody loves them more than I do. I just took a bunch of kids to the crocodile park last Thursday and was greatly impressed by those great lumbering creatures. There is one old nile crocodile there called Paco who is 90 years old and is the father of most of the crocodiles in the park. He is absolutely huge. He impresses his four 25 year old girlfriends by lying at the bottom of a pool and bubbling air out of his eye sockets. My wife does not know this, but I have similar plans for my old age. When I am 90 I want to have at least four 25 year old girlfriends. I can´t do the eye socket thing yet but I´m working on it. The appearance of crocodiles where they are not expected is a little worrisome. There is, at least in theory, a small chance that I may end my fishing career inside the belly of a great reptile. I don´t particularly want to end it all this way although I guess it beats cardiovascular disease or cancer hands down. No dribbling in an old folks home for me! No incontinence pads, no endless repetitions of fishing stories, no forgetting everything – just a glorious death roll, a muddy thrashing in the shallow water and finally, from the bowels of the Guadalhorce as the ripples subside, a happy, postprandial burp. 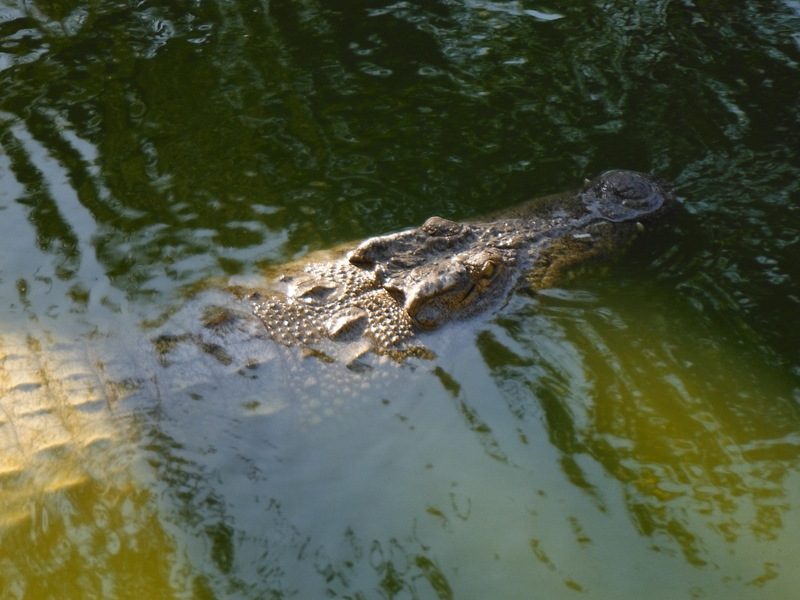 A nile crocodile swimming in the crocodile park, Torremolinos. A crocodile not swimming at Torremolinos Crocodile Park! Last night on the river I didn´t see any crocodiles, thankfully, but I saw plenty of turtles. These are often heard rather than seen as they tip themselves into the river from rocks and branches if you happen to come too close and interfere with their sun bathing. But last night they gave themselves away when their dome shells broke the surface of the shallow water. I came across four or five breaking the surface in this way and another one 20 metres or so from the river. It was lying on the ground with all its protuberances withdrawn into the shell. I imagine that it had left the river recently because it was still quite wet. For the hell of it I carried it back to the river to let it go in the hope it would start walking off and give me a chance to photograph it in action. But it had no interest in posing for photos and remained tucked in until I lost interest and wandered upstream where another turtle was more cooperative. 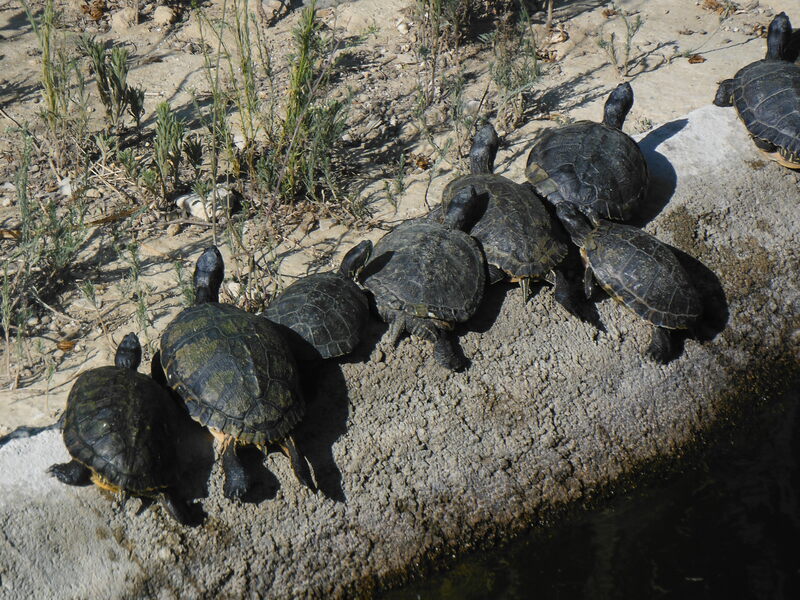 These turtles are native to the river and there are two very closely related sub-species. They are threatened by the invasive red necked turtle from Florida which everyone keeps as pets and which escape or end up being released into the wild, often by well-meaning people. In some areas, like Doňana national park, the red necked turtles are actively eradicated or removed. I hope that the Florida turtle keep away from my local stretch of the river. And the crocodiles too! The popular Florida red neck turtle. This invasive species is displacing native turtles. 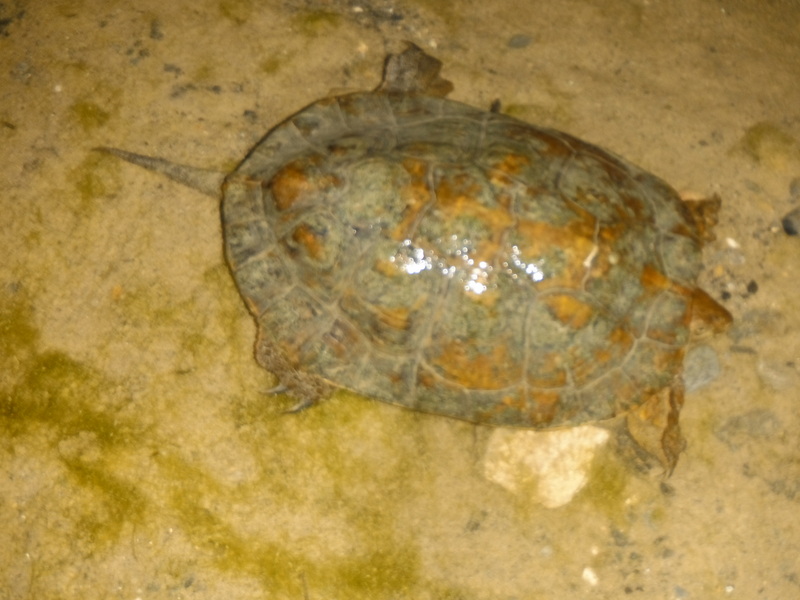 A wild turtle seen swimming in the river last night.